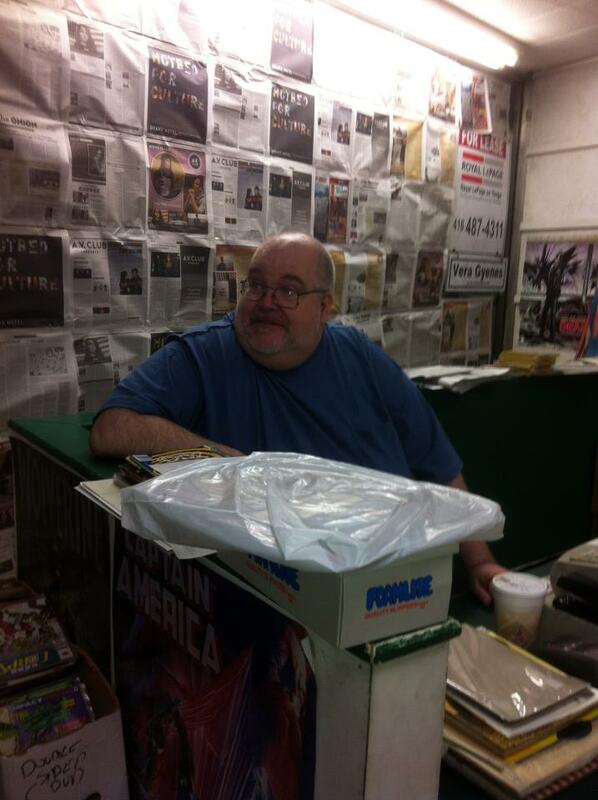 Joe Kilmartin, at the counter for the last day of business. 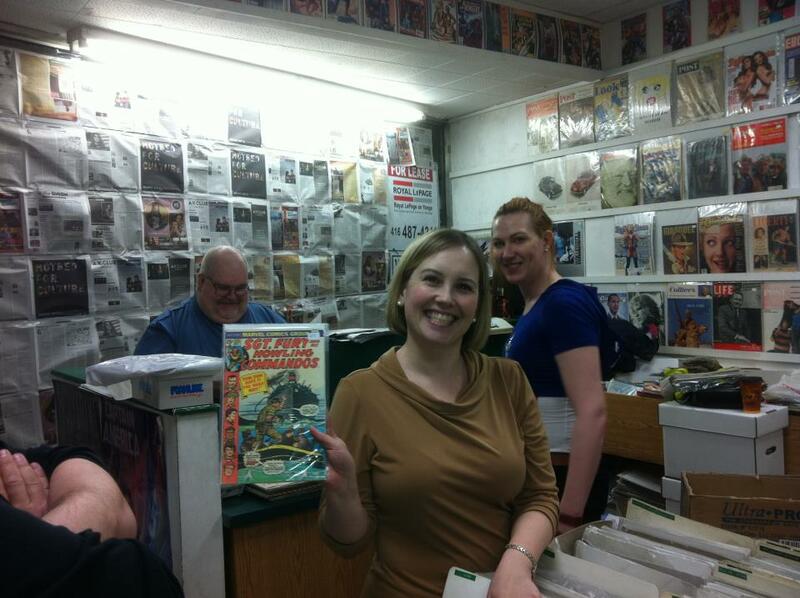 Yesterday afternoon, Debbie and I headed over to 609 College for the final open hours of John Biernat’s Dragon Lady Comics and Paper Nostalgia. When we arrived, the first thing we noticed was that the familiar window had been covered by old newspapers. Inside, manager Joe Kilmartin and long-time employee Dave MacPherson were overseeing the packing up of the comic bins, putting them all in long boxes and putting them in the back for when they get picked up to be taken to Kitchener on Saturday and into storage. It was a bittersweet moment — everyone was in good spirits, laughing and joking as things got put away – commenting on this cover or that, looking over a stack of vintage war related magazines and comics, and discussing various items that had been discovered during the month-long process of emptying out the back storage room and the basement. We talked about old employees, and who had been in over the past month or so, and there were a few “whatever happened to?” questions. We spent some time discussing what of the old bins and racks we would need to move over to the new Comic Book Lounge location (at 587A College) and looking over the remaining graphic novel stock to see what we could use in the new store. Over the next few days, the staff will be emptying out the remaining bins of old magazines and paper nostalgia, prepping them all for the move to Kitchener. They’ll be clearing out the bookshelves and packing them up to go to Kitchener or to the Lounge. Member files not picked up will be moved over to the Lounge as well.Everything has to be out by this Sunday. At the end of the day, after Joe had locked the door, a man and his son were peering in through the door and wondering why the window was covered in newspapers. 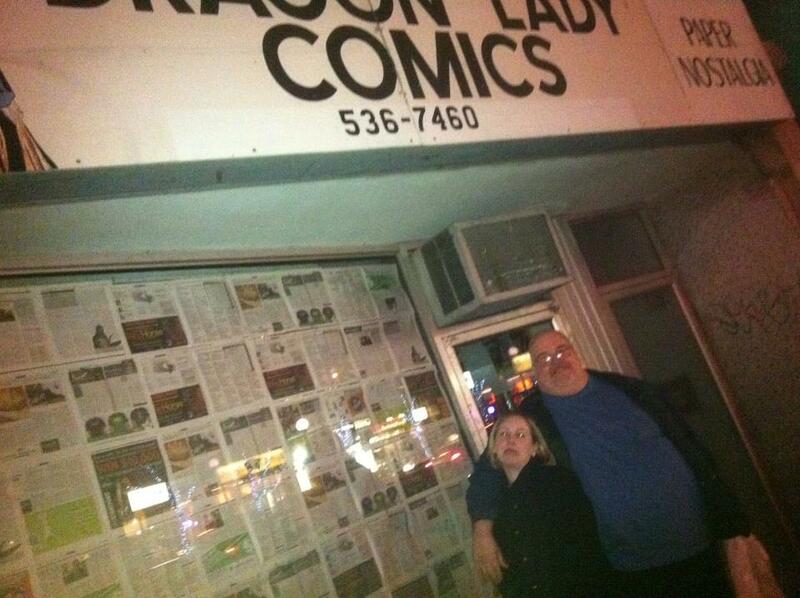 After we told him what was going on he said “I remember when this store opened up here on College… I stopped buying comics long ago, but this is my son and he would have been born shortly after you had opened here (his son looked about 14 or 15), but I’m trying to get him interested in comics, so this is disappointing we can’t go here anymore. We always talk about Superman when we pass by your window.” (The DL window had a Superman standee in the window). When we told him that the new store would be opening up next week, right next to the Mad Italian restaurant, you could see his son was getting excited. “We’ll be by to check it out next Friday when we’re here for dinner”. “Can I bring one of my buddies?” his son asked, “he’s also into comics. And so it goes… as one door closes, another is about to open. Deb and Joe after locking up the store. The end of an era.